The Cocker Spaniel is a small dog belonging to the sporting and gundog group of breeds. He is energetic, gentle and affectionate with an extreme desire to please his owner. 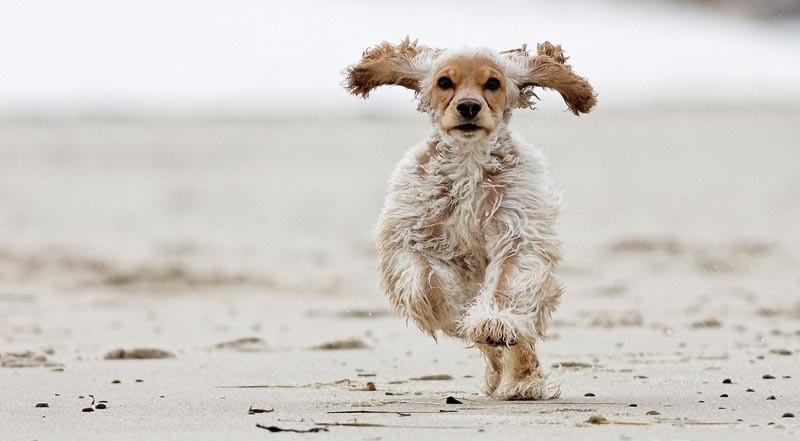 The Cocker Spaniel origins can be traced back to 14th century Spain. Prior to the 1600's all types of spaniels were categorised together; the larger ones were used to spring game and the smaller ones to flush out woodcocks. Hence the names Springer and Cocker were derived. In 1892, the Kennel Club of Great Britain differentiated the two breeds separately. In the 1930's, the Cocker was the most popular dog breed in Britain and remained No.1 for almost 20 years! During that time, Americans were using the same breeding stock to develop a slightly different Cocker. In 1940, the Kennel Club finally split these Spaniels into American and English. 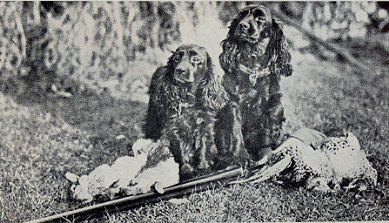 A pair of American Cocker Spaniels was brought into Australia during World War II and the breed is still very popular today. We follow England’s lead and call them Cocker Spaniels here. In the USA they are referred to as English Cocker Spaniels and American Cocker Spaniels (as we know them here) are referred to as just Cocker Spaniels in the USA. 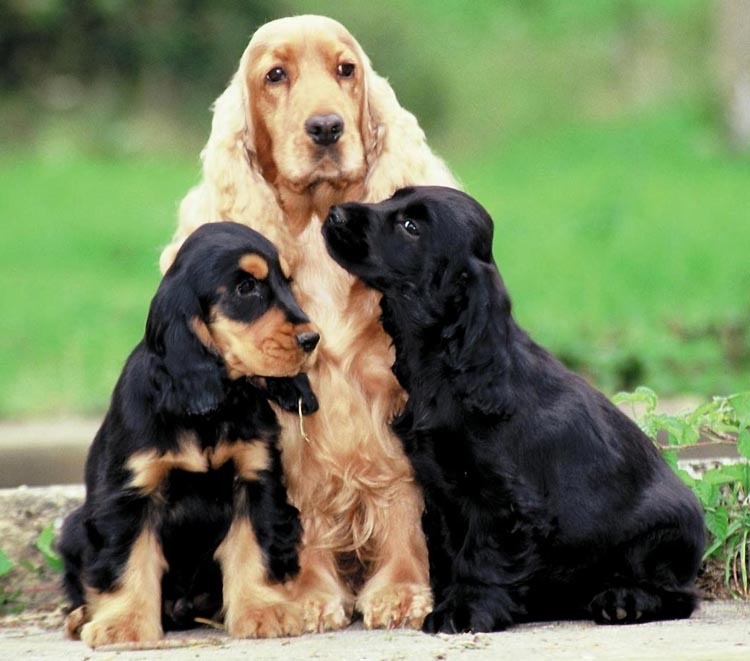 The Cocker Spaniel’s major beauty is their soft wavy coat. Combined with their domed head, big brown eyes and soft floppy ears it is a breed of enormous visual appeal. A small dog, they reach about 40cm (16″) at the shoulder and weigh about 13kg (29lb) when fully grown. Cockers come in a multitude of different colours (over 30 colour combinations) including: solid colours of black, red, orange and brown, combinations of black with white, liver with white, red and white, blue roan, orange roans, black roans, particolours and tricolours. Cocker Spaniels have a very sociable character and love nothing better than to be with their family which means they can be prone to separation anxiety and do not make good guard dogs. Few are used today as gundogs. 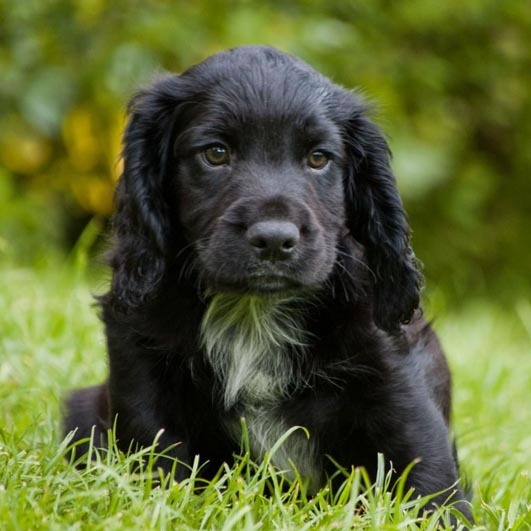 Cocker Spaniels enjoy work and mental stimulation, making an excellent pet for active families and they also excel as sniffer dogs. Cocker Spaniels are extremely trainable: intelligent and always eager to please, this combined with their attentive nature means they learn quickly and are generally very obedient. Cockers are used in field and agility trials, obedience competitions, as companions or seen in the showring. Your Cocker Spaniel needs regular exercise – a daily walk or an energetic game – although a large backyard is unnecessary. They love to swim and any exercise involving water and exploring exciting off-lead areas will keep the average Cocker very content and happy. Cocker Spaniels, like all dogs, need to explore their world and they take great delight in new smells and experiences. Cocker Spaniels can become gluttons if permitted and will put on weight very quickly. It’s easier to monitor their diet closely to prevent future issues with dog obesity (potentially leading to pancreatic cancer or pancreatis) or even diabetes. Ask the breeder if the parents are DNA-tested. If the breeder says no or refuses to answer, find another breeder. One carrier parent is acceptable but if parents are untested, or one is tested a carrier and the other untested, find another breeder. PRA is an inherited disease of the retina in dogs, in which the eyes are genetically programmed to go blind. PRA will generally have an onset at 4-7 years of age. The dog will develop night blindness and will eventually become completely blind. It is not painful and most dogs usually cope well if kept in the same environment with the same routine. This disease is rare but there are carriers in Australia and there is a DNA test available for this disease. As with PRA, be sure to ask the breeder if the parents are tested for FN, and at least one parent is clear. There is no treatment for this genetic condition. Puppies typically die in their first year, and up to two years of age. Cocker mouths can sometimes become very smelly - as if something crawled in there and died! Check for possible causes such as foreign bodies and teeth problems (pups can be a bit smelly around teething time and this will resolve by itself usually). If there is nothing obvious causing the smell, you need to ensure that the fur is closely trimmed around the mouth. Long fur around the mouth enables food to stick there and cause infection among the lip folds. Eye conditions such as Cherry Eye and Entropion are also seen occasionally in Cockers. Always check the puppies for nice tight rims and clear eyes when assessing a litter. A health check at the vet in the days immediately after welcoming a new dog is always recommended. Cocker Spaniels have an average lifespan of 12- 14 years. Cocker Spaniels are adaptable dogs which can be kept inside or outside. They are excellent companions inside the house but do drop hair. Although not noted for being ‘diggers’, some may become accomplished escape artists while individual dogs are known to climb fences! Although a small breed, the Cocker still needs daily exercise. Digging holes in the garden can be a sign of boredom. Ideally this breed needs to be allowed off the leash to run free, providing it is safe to do so. Such free exercise periods should be well supervised, with the dog kept within calling distance at all times. Cocker Spaniels are a long-coated breed so regular grooming involving a brush and comb all over the body is needed at least once every two days. As the puppy coat comes down from about 7-8 months onwards, the coat will need stripping to remove the fluff, and a general tidying up. 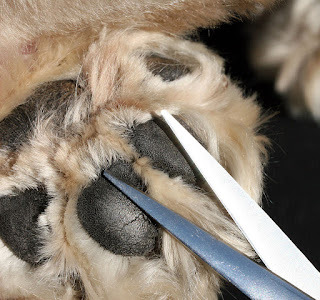 Feet should be trimmed to remove excess hair, especially from beneath the paw pads, and the foot should be trimmed around to look tidy and give the impression of a cat's paw. Ears should be checked for burrs, grass seeds or bad smells daily. They need to be free from hair and fur around the base of the ear to allow air to circulate and prevent ears getting moist and mucky which is how ear infections begin. Cocker Spaniels require time and great care to bring their coat into full bloom. 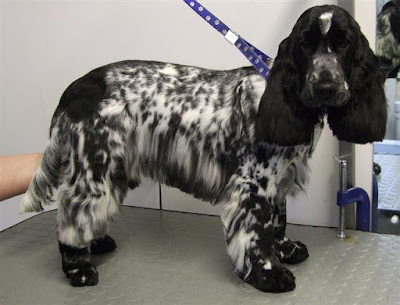 To achieve this, frequent brushing and bathing is needed or regular trips to the grooming parlour - A Cocker Spaniel requires a clip every 10-12 weeks. This applies not only when they are puppies, but also for the lifetime of your dog. 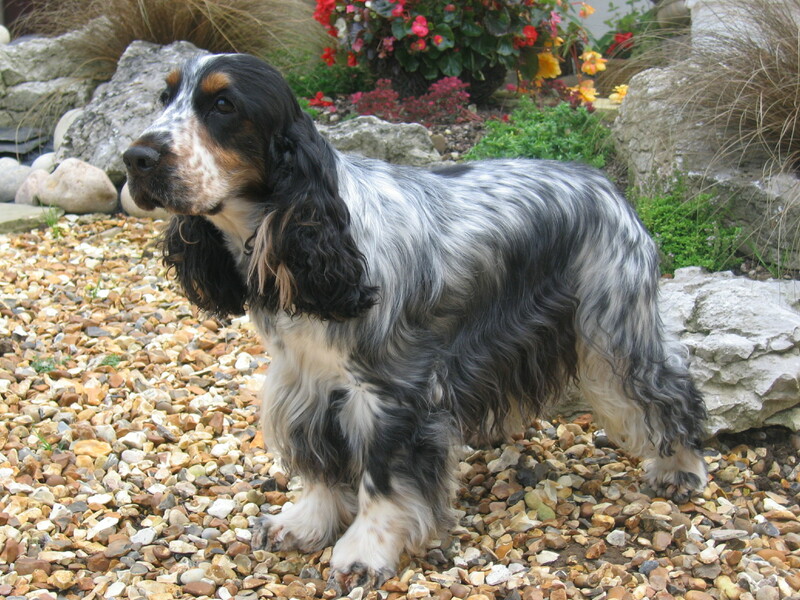 While the American Cocker looks very elegant when in full coat, many pet owners keep their dogs in "pet clip" – leaving the coat only about 5cm in length on the legs and stomach. This significantly reduces the tendency of the coat to knot, and makes bathing, drying and grooming much easier. Cocker Spaniels are excellent with families and older people. They are adaptable and robust enough to cope with school-aged children but may not tolerate toddlers or pre-schoolers. Cocker Spaniel Club of QLD Inc. The American Cocker Spaniel Club Inc.
Cocker Spaniel Rescue QLD Inc.